Just as watching your diet is important to maintaining your health, your dog’s diet is crucial to their optimal growth and health. What, how much and how often you feed your dog will determine your pup’s mental and physical health. Small dogs’ bodies are made up of 50 to 60 percent water; therefore your furry friends need cool, clean water available at all times. Don’t worry about how much water you leave out – your pet will only drink what he or she needs. Small dogs grow faster than larger dogs and have a faster metabolism, meaning they require more proteins and fats in their diets. Also, with their smaller stomachs, small dogs need to eat more meals per day. Numerous dog food brands compete for your attention in the pet store food aisles, so how do you choose the best food for your four-legged friend? Now that you know which food to feed your dog, you need to know how much to put in the bowl. Start out by using the suggested serving size on the food you purchase and adjusting accordingly. Or, use this handy Dog Food Calculator from Dog Food Advisor to estimate the proper serving size for your pet. Simply enter your dog’s ideal weight (what you believe your dogshould weigh), activity level and calories per serving of the dog food. The calculator then provides you with the amount of dog food to give your pup in cups or kcals per day. Make sure to weigh your pet every few weeks and adjust the amount of provided food accordingly. How often your furry friend gets food depends on your choice between two leading methods: free feeding and scheduled feeding. Proponents of scheduled feeding claim the method makes it easier to housebreak and train your pet, allows for a larger variety of foods (homemade, raw, canned, etc. ), and prevents obesity. However, you must be available for feeding, which may prove too time consuming for you, and obesity can still occur if your pet is overfed. On the opposite side of the spectrum, free feeding proves an easier, more convenient and less time consuming option for you, and prevents hypoglycemia. However, housebreaking and training could prove more difficult, and your food options are limited to commercially prepared kibble. Plus, dogs that don’t learn control can easily overeat, leading to canine obesity. Neither method is wrong; the correct method is the one that works best for you and your pet, so take some time to experiment and choose the best method for you! 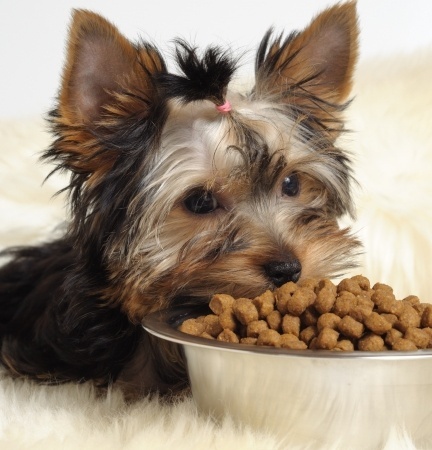 Remember, small dogs function better with multiple meals per day, and you should aim for two meals per day for adolescent and adult small dogs and three meals per day for puppies.